How do I connect to my iPhone from my Windows 7 computer with Bluetooth radio? 1. Turn on Bluetooth on your iPhone and make it as discoverable. 2. Turn on Bluetooth on your Windows 7 computer. 3. Go to "Control Panel > Hardware and Sound > Devices and Printers" and click "Add a Device". 4. 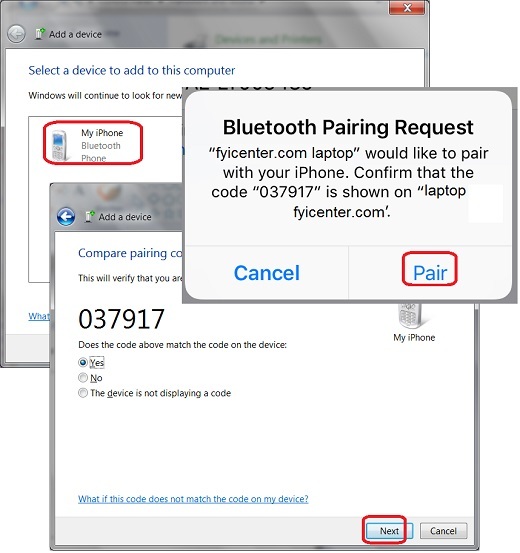 Wait for your Windows 7 to finish discovering the Bluetooth device on your iPhone. You will see your phone icon, named as "My iPhone" for example, showing up. 5. Double-click "My iPhone". You will see a pairing code generated by your Windows 7 system: 037917. "fyicenter.com laptop" would like to pair with your iPhone. 5. Tap on "Pair" on your iPhone to confirm. 6. Click "Next" on your Windows 7 computer.